Normal panda bears sit around in the forest, eating bamboo. Normal panda bears don't have social media or a dating profile. Normal panda bears don't eat burritos, or paint excellent pictures of anime characters, or have a favorite TV show. Panda, from the cartoon We Bare Bears, is not your normal panda bear. Panda Bear's life started out in a somewhat normal fashion. He lived in an animal sanctuary, where he ate his fair share of bamboo, but yearned for something more than just his simple life. Then, he found out about TV. The rest of his life centered around finding the little glowing box, which eventually brought him to his brothers, Ice Bear, and Grizz. Now, he lives quite the extraordinary life for a bear, even if it is a pretty ordinary kind of life for any human being! Now, your child can become the out of the ordinary bear from the show when he wears this We Bare Bears Panda costume for kids. 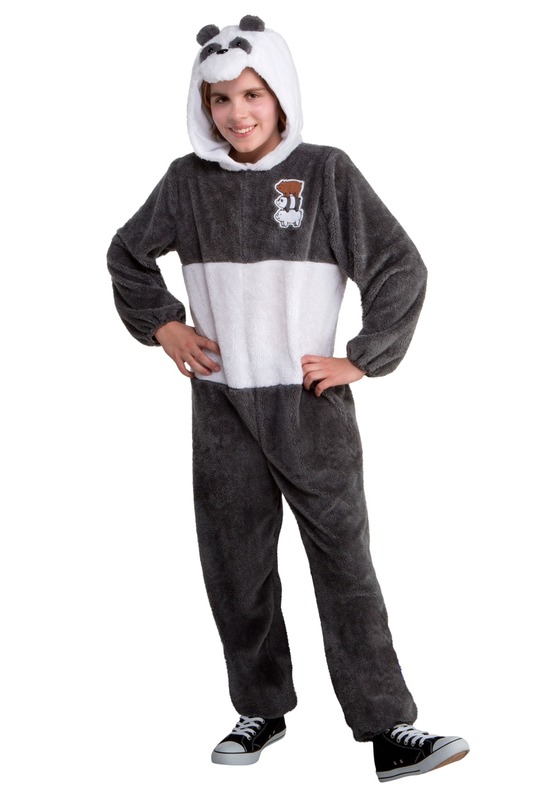 The costume comes with a jumpsuit that is covered in a soft faux fur material. The chest has a "Bear Stack" emblem embroidered onto it. Of course, the final piece to this costume is the hood! It's designed to look like Panda Bear's face and it has a plush nose, beady little black eyes, and a pair of round little ears on top! It's a great look for any young fan of the Cartoon Network series. If your child is ready to cut loose as his favorite bear, then all you need is this licensed We Bare Bears costume for kids! Don't stop there, though. You can unite the three brothers for your next costume party when you pair this up with our Grizz and Ice Bear costumes. The great news is that they come in sizes for both kids and adults, so you can get the whole family involved in a little We Bare Bears cosplay.